Cinema often turns to the music industry for inspiration. There are countless fictional films, true life movies and documentaries based on the fascinating lives of vocal artists and musicians. Following the release of Kevin Macdonald’s moving documentary, Whitney, I take a look at five powerful documentary films about incredible female artists - including Whitney Houston, Nina Simone, Janis Joplin, Darlene Love, Lisa Fischer and Amy Winehouse. Featuring letters and interviews with her family and friends, Amy Berg’s documentary, Janis: Little Girl Blue, explores the life of 1960's rock legend, Janis Joplin and reveals a heartbreaking story about a hugely talented, yet truly fragile soul. 4. Whitney: "Can I Be Me?" Mere months before Kevin Macdonald’s documentary hit cinemas, Nick Broomfield’s Whitney Houston film was released. Starting with the inevitable emergency services call, the film moves chronologically through the remarkable life of this phenomenal vocal artist. However, Whitney "Can I Be Me" never lets you forget the end of this story - tingeing Whitney's meteoric rise with the sense of impending tragedy. 3. What Happened, Miss Simone? Using never-before-heard recordings, archive footage, diary entries and interviews with family and friends, this gripping film explores the life of a legend. Nina Simone possessed a breathtaking musical talent and lived a fascinating life. However, her marriage was violent and tempestuous and she also suffered from mental illness. Liz Garbus’s documentary takes us behind the scenes to show us the joy and the darkness behind what happened to Miss Simone. You might recognise their voices but you may not know their names. 20 Feet From Stardom tells the remarkable story of the unsung backup singers (including Darlene Love and Lisa Fischer) behind some of the greatest musical legends of the 21st century. This gripping film won the Oscar for best documentary in 2014 and it is easy to see why. The artists featured range in style, musical era and genre but all tell a fascinating and deeply personal story of a life spent in the shadows. 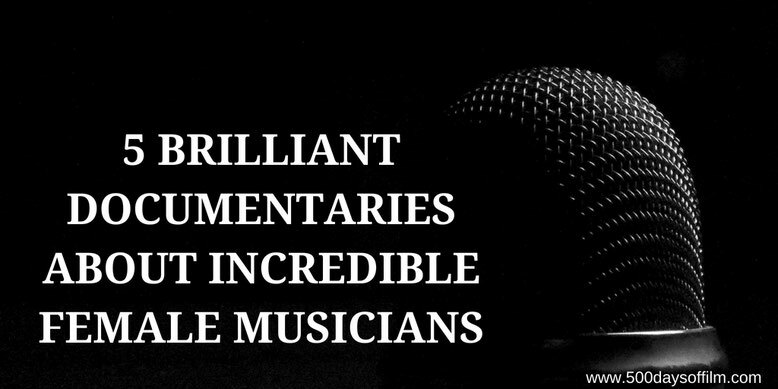 Director, Morgan Neville uses archive footage, a superb soundtrack, intimate interviews and wonderful testimonials from the likes of Bruce Springsteen, Stevie Wonder and Mick Jagger. However, he never loses sight of the real stars of his film - the backing singers. Asif Kapadia’s Oscar winning documentary about Amy Winehouse set the gold standard by which all future music documentaries will be judged. Despite its traditional structure (starting with Amy as a young girl and following her to the end of her life) and a story that is all too familiar, Kapadia’s film is both insightful and surprising. The main surprise is Amy herself. She tells her own story and is present in almost every scene thanks to the remarkable amount of footage that was taken of her (and, on occasion, by her) during her short life. Amy is also present in her songwriting (we see pages and pages of her almost childlike script) and via her lyrics which often appear on screen. That we see so much of Amy in this film (much in extreme close up) makes this documentary an intense and, often, extremely tough watch. Have you seen any of these documentaries? If so, what did you think of them? Do you have any music documentary recommendations to share? Please do let me know your thoughts in the comments section below or over on Twitter. You can find me @500DaysOfFilm. I've seen all of these except the one on Whitney Houston and they're all great. Another I highly recommend is Miss Sharon Jones! I believe you can find it on Netflix.